After waiting 4 months for the weather to improve and for Rupert's and my schedule to mesh, we got the chance. I drove up to his place and away we went. First the template is sprinkled with a release agent (parting dust) which is something like talcum powder held in an old sock. A riddle is a fine mesh screen that is used for separating the lumps out of the green sand (which is actually black in color). The green sand is a combination of fine sand, clay and water, mixed together so that when you squeeze it, it holds the shape without falling apart. The wooden boxes are called flasks and the two sided template is sandwiched between them. First, one side is partially filled with riddled green sand. 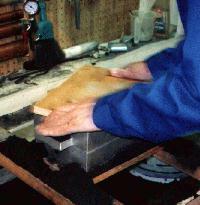 The sand is then pressed tight against the template with your finger tips. You have to press very hard and an important point is not to smooth the surface of the green sand. Smoothing the surface will cause the green sand to separate between layers when the flask is turned over. The sand basically falls apart. Next, some more green sand is shovelled in (does not have to be riddled) and rammed in place. You use a lot of force here, so much that you think that you may break the template! When ramming, you start by packing in the sand from the outer side of the flask and working your way in towards the center. You do not make the layers smooth, you want to leave a rough unfinished surface which is exactly the opposite of what you think you should do. You need the rough surface so that the next layer of sand has something to grab on to. After ramming in two more layers, the last layer is packed smooth by using the flat end of the ram. Again using a lot of force. When the sand is properly rammed, it should be very difficult to make an indentation in the sand by pressing with your thumb. 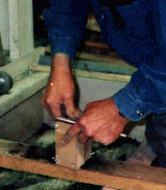 The excess sand is skimmed off using a straight edge like a handy piece of angle iron. Finally the surface is smoothed by sprinkling on some more green sand and using a flat board to rub the sand in a circular motion. 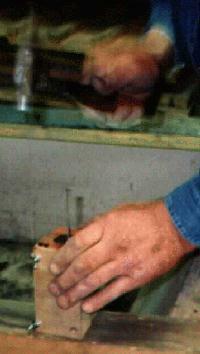 The flask is turned upside down and the procedure is repeated for the bottom side of the flask. BTW the top side of the flask is called the cope and the bottom is called the drag. 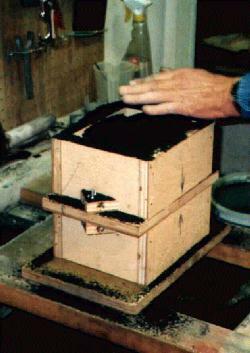 After both sides of the flask have been rammed with sand, the flask is separated and the template removed. 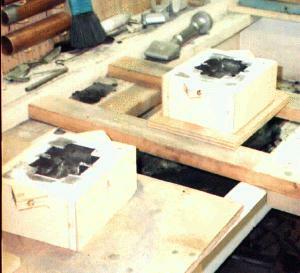 The moulds are checked to see if the sand has held in place properly. Minor imperfectations can be fixed at this time. Interestingly, usually imperfections cause more material to be added to the part. This just means that a little more machining may be required. Both cope and drag are sprinkled with more parting dust so that they don't stick together yet. 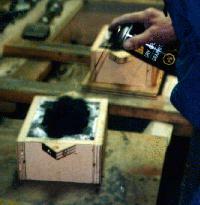 For a smoother finish, dry graphite lubricant can be sprayed on the mould. At this point the mould is ready for the cores to be installed. Risers, sprue and vent holes are made in the cope side. The sprue hole is used for pouring the liquid metal into the casting, the riser hole allows excess metal to escape and the vent holes prevent air pockets from forming that may stop the mould from filling completely. The risers and sprues are made from 1" - 2" copper pipe pressed into the rammed green sand. The vent holes are made with coat hanger wire. Using a copper pipe to make the sprue and riser. 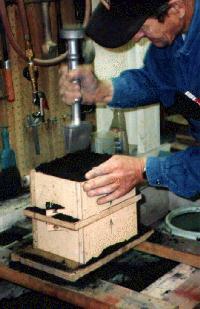 The exhaust passages are made by adding a sand core to the mould. 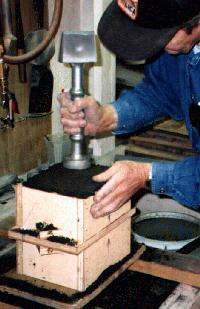 A wooden core template was made and the sand was pressed into it using your fingers and then rammed into it using a steel rod and hammer. After the sand was tightly packed, a 4 inch nail was hammered down the center to provide support. 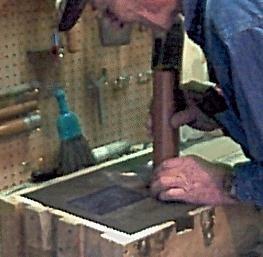 The core template was separated and the core removed. 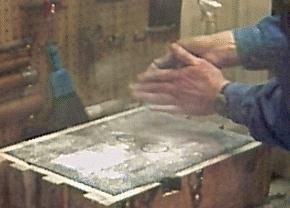 It was placed on a wood stove to dry out any water vapor, otherwise there is the risk of exploding the core during the pour. 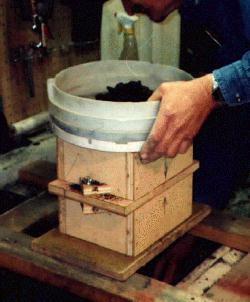 After the core was dried for about an hour, it was coated with graphite and placed into the mould. Next came melting the iron and pouring it into the flask.